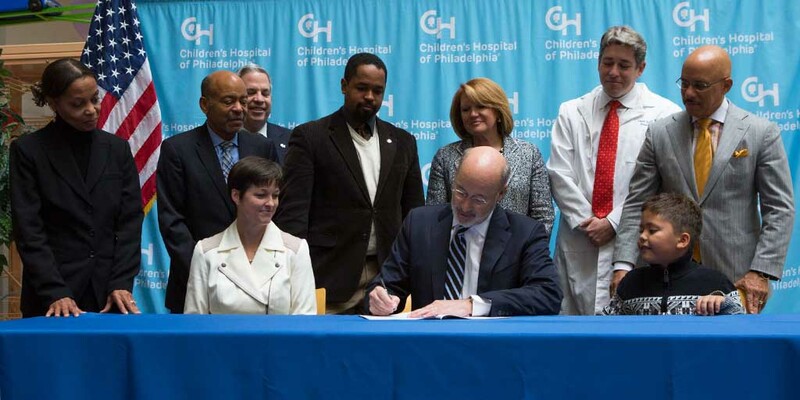 Philadelphia, PA – With state legislators, cabinet officials, health care providers, families, and Children’s Hospital of Philadelphia (CHOP) administration and clinicians joining him, Governor Tom Wolf today held a bill signing of legislation to protect children’s health care through state funding of the Children’s Health Insurance Program, commonly known as CHIP. Federal funding accounts for 90 percent of the $450 million CHIP budget. Congress failed to reauthorize CHIP before the Sept. 30 deadline and has not yet addressed funding for the more than 9 million children nationally who benefit from it. Acting Secretary for the Department of Human Services Teresa Miller conveyed the need for federal funding. Pennsylvania’s CHIP legislation was sponsored by Representative Rich Irvin.